Tardis Remakes' Dingo is a very attractive, colourful and well-executed conversion, with one or two little niggles that I will come on to later. 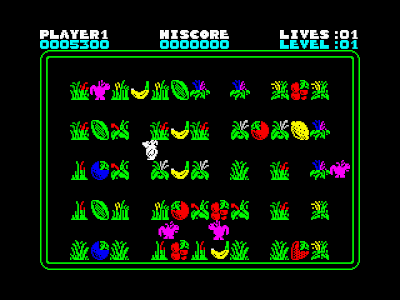 The action in each level is based on a single screen laid out in a grid, with Big Ted's fruit scattered liberally throughout. You must traverse the whole melon patch until you have collected all of Ted's bananas, lemons, blackberries, tomatoes and – of course – melons. However, shortly after the action starts four stealthy dingoes emerge from the undergrowth and start terrorising the melons. Big Ted is not tough for a bear, and will immediately keel over if caught by a dingo, so watch out. Luckily BT can run pretty fast so as long as you don't get cornered you should be alright. You can also throw the last piece of fruit you gathered to stun a dingo – but beware as dingoes can also throw fruit at you. If BT gets hit he will lose a life – massive softie that he is. 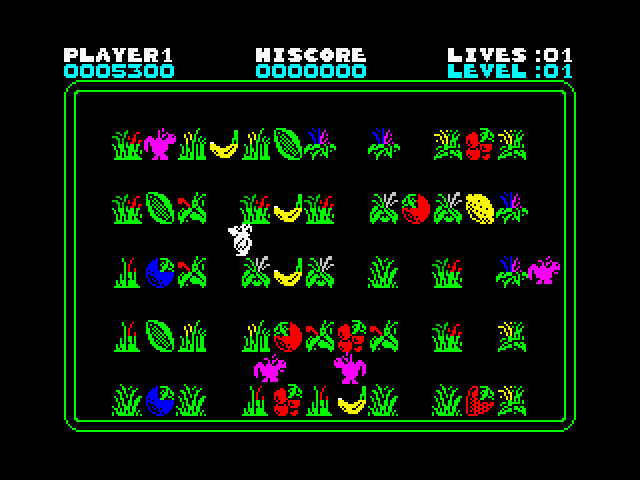 Each level is the same, as far as I can see (only having progressed to level 9), with just a random distribution of fruit for variety. It is a shame that there isn't more of a progression in the game, for example: different level layouts or different enemies. Your goal is therefore to progress as far as you can and score as highly as possible. Even with the addictive nature of the game I can see it eventually losing its appeal due to this lack of variety. One nice touch that adds interest to each level is that BT will be challenged to pick up a combination of fruit to achieve a points bonus (which are chained if you collect multiple sets). This does encourage risk-taking to gain a reward and I think this small touch really enhances the game. The dingoes move around fairly randomly and are not drawn towards BT or any remaining fruit, which is a blessed relief! If you find yourself on the same line as a dingo it will throw fruit at you, so a good tactic is to 'hover' behind undergrowth and wait for the coast to clear. There is no time limit to the game so patience is the key to success. If BT tries to mix it up with the dingoes too often he will surely come off second best! The major positive about this game for me is the way it is presented with colourful, well drawn graphics throughout, with minimal colour clash. 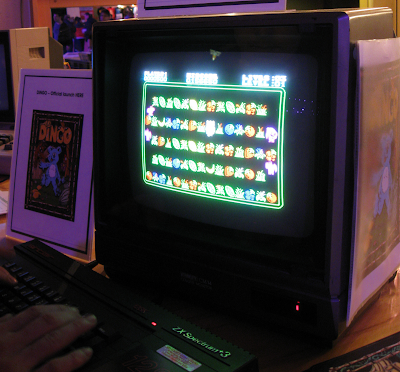 The sound and music is also well implemented for a 48k game and both enhance the game whilst not becoming annoying. The game-play is good and BT moves around smoothly and swiftly. The only criticism here is that BT's cornering is not the best, and if you don't get it just right he will get stuck (and potentially be mauled by a dingo!) Once you get used to the controls, this can be overcome as you can hold down two direction keys at once to guide him around obstacles. To begin with it is a little frustrating and my esteemed colleague James was rather vocal in his criticism of this feature! Perhaps an 'assisted cornering' feature could have been included and this would have aided playability. The only other gripe is that those dingoes can slink out of the shadows at the start of each level right underneath BT, which hardly seems fair! Luckily, they always emerge in roughly the same place, so you can give them a wide berth until they appear. 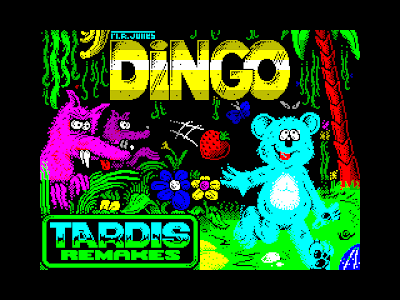 Overall, Dingo is massively addictive (of the 'just one more go' variety) and the difficulty level is just about right, with a reasonable 25,000 points required for an extra life. It is a shame there isn't more progression in the game to enhance its longevity. 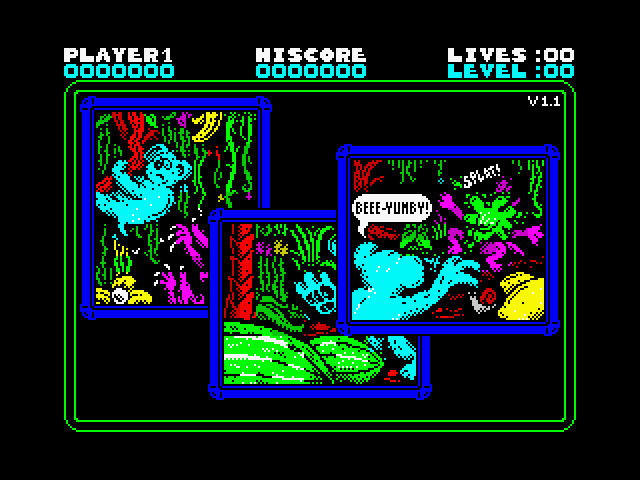 However, I really enjoy playing it and I think it uses the graphical and audio capabilities of the 48k machine very well indeed. I can only quote the fruit-lobbing battle-cry of Big Ted in yelling Beee-Yumbly! Like the review and glad you liked it!